These are lessons that stem from my own personal experience and I am certainly not telling you how you should live your life. We all have different values and philosophy, and I know I don’t know how to be a human being any better than you. I chose to take on this little exercise as I approach 30 because I thought that would be a suitable point… 30 is a dramatic age after all. Nevertheless, however old you are, I encourage you to think of little lessons you have learned and maybe compile a list. It has been a very interesting experience… like spending a day hanging out with the younger version of yourself. It’s like your brain is playing old home videos. I think you might just surprise yourself with what you remember. My 20s have been a thrilling adventure, as I’m sure yours will be, are, or have been… Still, I’m looking forward to my 30s, I think this is the decade where I’ll really come into my own. For 3 years, I made a bit of spending money working as a background performer or commonly known as an extra. What was it like? Well, there was a lot of sitting around. I was reading Stephen King’s The Dark Tower series at the time and was always hoping that I can finish all of it before the end of my shift. However, I was never that fast of a reader. I digress, being a background performer taught me many things including I don’t like trading my time to be a little blur in the background for 3 frames or meeting Zach Effron. There was a lot of waiting involved with the job, but they rush you. They tell you to hurry up and get on set so you can wait for the next order. As much as I disliked the job itself, the monotony of it, I like that lesson a lot… probably as much as I dislike the job. Hurry up and wait, means always being ready. When an opportunity comes, it’s going to look around and pick someone to take it… it will not wait for you to show up. Be ready. Hurry up and wait. In school, I would always see kids who raise their hands waiting for their teacher to address them so they can speak. Me, I would shout out. If I had something to say, I shout it out. I got in trouble for sure, that was when I interrupted someone, but everybody heard me. This lesson is not about being rude, but it’s about being assertive. I have spoken up without raising my hand a lot as an adult. In fact, it would look weird if I’m around a group of friends and I raised my hand to speak each time. In school, we are bred to follow the rules and wait for permission for anything. As an adult, waiting for permission for everything you do will hold you back. You don’t need permission, go for it! Love is not accepting someone for the way they are, it’s wanting them to be better. Your regular friends want you to be the way you are. Your wife, your mother, they want you to be better. The thing they want you to be the best at is loving. So do that, it’s the easiest way to please the people you love. There is nothing more beautiful than every day waking up and seeing the progress you have made with someone that you and the person you love are making strides towards your goal. That’s the beauty of love, in my opinion, it’s not to keep someone in a static state, but to watch someone evolve. In a hockey game or after a heated argument, you won’t get sympathy from those that beat you. One time I was fighting with my cousin, I pretended to be dead for a few minutes, yes I’m admitting it now, I pretended. No sympathy for my faux injury. In hockey and in life, you have to honor the game you are playing. If your opponent beats you in hockey, they should celebrate knowing that they had to work hard for that win. It wasn’t easy for them, they worked really hard to beat you… but they did beat you. If someone gets a promotion at work over you, honor that. They played the game better. You need to up it in order to survive. Let’s not try to get sympathy from people who have succeeded, but rather let that feeling of loss fuel you, so next time, you will win. I’ve read great book’s, I’ve watched amazing movies, and I’ve listened to moving music, but nothing passes the time like those moments where I’m able to create my own entertainment. I grew up an only child in a family with one television, so often I had to make my own entertainment. It was the most valuable thing that I can learn for myself. I can honestly say that I am rarely bored. I am exhausted, sure. I am ready to move on to another project, sure, but I am never bored. Being able to entertain yourself is simply being aware of what makes you laugh and what motivates you. Once you’ve had that figured out, it’s like having a best friend with you wherever you go… someone who fully understands you. You can look at someone crossing the street and crack a joke to yourself in your head and chuckle… nobody has to know that you just made a rude joke in your brain. Make your own entertainment is all about being comfortable with yourself and trusting that your imagination is as good as any filmmaker, author or musician. As a goalie, I make an effort to be early. It’s one thing my team won’t have to worry about if I’m already there getting dressed. It makes everyone feel better if you are early. I know how important it is to be early because there have been countless times where I am late. Being late isn’t only stressful for me, but it’s stressful for my whole team. They have to start readjusting their plans and chaos ensues. I personally hate being late… even fashionably late. So often I show up to a party early only to circle around the block a few times or wait in the car. But that beats being late where you are all frantic or apologetic to the person waiting. Be early. Take a moment to get ready. It’s so much better than the alternative. There is no greater honour than having peoples attention. People’s attention is the gold of the future. Whenever I have someones or a groups attention I need to do at least one of three things: inspire, educate or entertain. Sounds hefty, but that’s the responsibility of having the spotlight. When I was doing standup comedy, I relished being on stage. Waiting for 3 hours at a bar during a Monday night open mic was worth it if I got that 5 minutes of stage time. Now with social media, we have to fight for attention ever more. If you are called upon to be on stage or make a speech, enjoy it, it is something so many people are fighting for. 8. What I’ve learned while having odd jobs: Make one friend everywhere you go. I’m lucky, every job or school I’ve had, I was able to make a lifelong friend. Film School, Starbucks, the Olympics, etc., I was able to find a friend within that community, activity or experience. It made life so much better… and if you are lucky… or if they are lucky, they will join you in the next phase of your life. Be loyal. Stand behind that friend. Work, school, sports those little things don’t matter in the long run. What matters is how loyal you are to someone. Don’t backstab someone and have trust they won’t do the same. These experiences won’t last forever, but the legacy you leave be will. So if you make one loyal friend everywhere you go, you will always have a fond memory of that place or experience. I used to be an actor, I still am, but I used to as well. A little lesson I picked up as an actor — don’t know if it’s proven or not — is that during an audition, if you apologize, you admit that you’ve made a mistake, and the result is that you won’t get the part. As Canadians, we feel we need to apologize. We don’t have to. We did nothing wrong. Saying the wrong line in an audition is not grounds to apologize. Instead of saying sorry, roll with it or start again. Don’t immediately admit fault. Nobody got hurt. I know that apologizing is “polite” but not saying sorry doesn’t make you “rude.” Some of the best things in the world come from mistakes and sometimes we don’t realize it at first. Instead of saying sorry, say thank you. Thank you for letting me try something different. Deep down, I always knew that nobody cared how hard I worked. This year I discovered it the most, after working 63 hour weeks. Nobody cares. Nobody will congratulate you. Nobody will celebrate it. They’ll even make you feel like you are harming yourself. If you are working, you need to do it for yourself. I have become more comfortable with how I choose to spend my time, and most often I feel like working, except, I don’t really think of it as “working.” Writing this description right now may seem like work, and in a way it is, but I’m choosing to do this on my lunch break instead of hanging out in the kitchen, chatting with my co-workers. Does anyone care that I’m spending my free time writing this description? No! Nobody! Not even you who are reading this right now. There is no reason to care. What’s important is the results. I get to decide how hard I press down on the pedal and when I want to let up. These are all my own choices, so why should anyone else care? This is the lesson I’m perhaps the most passionate about and want to encourage the most. Sample everything. The more things you try, the more open-minded you are and the more interesting you become. Listen to different music, read different books, try different food. I’m not a master at anything, but I’ve tried a lot. And I feel I’m far more interesting than any specialist. It’s so easy to get set in our ways and develop confirmation bias — hanging out with people that do what you like and agree with all your preferences and don’t do and dislike the same. These people are not helping you grow and they are certainly not out to challenge you. I will. Sample 10 different things this week. Try a new restaurant, listen to a new album, or play a new sport. Out of the 10, what did you like and dislike? For what you dislike, explain why you dislike it. Do this regularly and you open your mind. Fill up your plate, means always having something productive to do. Your schedule is always full and you are feeding yourself and allowing yourself to grow. After graduating from high school or college, it’s natural to sit back and wait for Hollywood to call. Except it won’t. Nobody is going to call. Saying yes to opportunities is so important. However, these opportunities might not be your dream jobs. They may be stepping stones or projects that are adjacent to the ones you want to pursue. Regardless of what you want to end up having on your plate, it was going out and looking for the opportunity that made the difference. Yes, I want to have a steak on my plate, but first I got to eat some vegetables. I got a salary job because I said yes. But I had to go to college first, I had to hustle as a freelancer for a few years first, and I had to put myself out there and get what I can get. I had to fill my plate. When I look back on the first 25 years of my life, I see a quitter. I see someone who had all these aspirations, went out an got an education, and then when the going got tough, gave up. Then when I take off my negative lens and actually see it from an objective point of view, I realized that I’m still doing all the things I thought I gave up on. One of my major life pivots was when I decided to quit pursuing filmmaking. But I haven’t. I’m a content marketer now and turns out marketing requires filmmaking skills. Huh… everything comes around. You don’t know what skill will come in handy. You don’t know when good relationships can spawn into big opportunities. You don’t know when a charitable act will return the favor. Life is full of mysteries, but life is also cyclical. It’s a beautiful thing when it happens and most certainly it will happen to you. I used to beat up on myself for having days where I don’t create something… I would fall into a slight depression where I feel useless and become unmotivated. I would end up getting frustrated and take my frustration out on the people around me as if to say, “why did you allow me to be so lazy!” I still go through these little dips in my day-to-day life, but I always remember this lesson: Not every day needs to be productive. My wife, Sharon said this to me once, and it was the most liberating thing anyone has ever said to me because if she said otherwise, I would always feel bad. She could have crippled me at that moment, but instead, she calmed me and assured me that one day spent in leisure would not mean that I can’t be successful. In fact, leisure is the result of my successes. Because I have worked so hard, I am allowed rest days. I take advantage of these days when I can and cherish them because I know, there will be other days that will be absolute grinds. As a professional writer, you cannot be precious with your work. When you hand a project whether it is a blog post or a whole book, you are going to receive feedback. A few words can be changed or a whole section of your book can be completely removed, and you won’t be able to do anything about it. Don’t be precious with your work means detaching your personal self from the project. It doesn’t mean not caring about the finished product, but rather understand that what you made might not be as great as you think it is. As an artist or a craftsperson, you are going to encounter feedback and criticism. You are going to face unrealistic deadlines and have unclear directions. You cannot be a perfectionist. To do and finish is to learn. I take this lesson with me whenever I create anything. It’s freeing when you are not precious. It’s freeing to know that I’ll get to do more work soon. I wrote so many short stories, made so many videos, and done so many things… most of them not successful, but I finished and I learned something. You can do it as well, but only if you lose your ego. No surprises is a lesson about communication and being a good teammate. I remember one time when I was dishwashing for a restaurant in Stanley Park, I decided not to show up one day. I was “not feeling well” and I figured it is best that I stayed home. When I showed up for work the next day, I was called out for it. They told me that if I didn’t want to or couldn’t show up for work, that is fine, but next time just let us know. it’s cool. No surprises. I realized that it’s not a big deal if I couldn’t make it, but I shouldn’t leave people in the lurch. Someone wants my job, but if you leave it to last minute then nobody can help. Life is better for everyone else when there are no surprises. After film school, I sent my resume out to as many production companies as I could. I ended up getting a gig as a location PA. The call time for the production was at 7pm, that meant it’ll be a 10 hour+ shoot through a rainy night. The location was in a big park around a lake and my primary job was to stand guard at the edge of the park and make sure that nobody wanders into the shooting location in the middle of the night. Not dressed for it, standing in the rain, I realized that I never want to do this again, let alone pursue it. I wanted to be a filmmaker, but this was not the ladder I was going to climb. I love doing a lot of stuff, but the key is to find things I hate. I never want to stand in the rain during production again. I hated that. I knew I didn’t want to work as a PA ever again. I had to choose another path. Now I can remember I hate that and do something else. There are many paths to get to your destination, just like how there are many ways to get to the number 10. 2×5, 1×10, 3+7, etc. That’s a little math metaphor for all you math junkies out there. There are many ways to get to a destination and you shouldn’t simply limit yourself. Take the road less travelled and find your ladder to climb. I live a pretty normal life. I have a set routine that I follow pretty much every day. Wake up, walk the dog, go to work, come home, eat dinner, chill with the wife, sleep, and repeat. It’s important for me to break from that routine once in a while. Or as I like to call it getting lost. For me, the opposite of routine is creativity. Getting lost allow me to feel creative. And there is one method that I can always use to ensure I accomplish that: Travel. The whole point of travelling for me is to get lost. We get so used to our daily routines. We need to get lost in order to find ourselves and grow. Nothing takes us out of our routine like living in another city, hearing another language, and waking up in a different bed. I don’t always love travelling, just like how I don’t always like exercising, but like working out, it is a healthy thing that I need to do regularly. Be an instigator means having the courage to take the lead. This doesn’t necessary mean being the leader, but it’s about being ready to go first. When you think of something you want to do — do it, even if nobody else is following. I learned this lesson over the course of my life, mostly from waiting for other people to invite me or to plan an event. Waiting is fine, but only if I know there is progress. If I’m instigating, something is happening. I’ve started some fights and I’ve started the planning of a few awesome camping trips. It’s so important to have the courage to start things, preferably good things, at least something you believe will be good. But it takes time to build up that confidence that you can cause change. So instigate something. Start something. Don’t wait for others to go first. Say “Good morning first” or smile at a stranger first. Whatever it is, go first. In 11th grade, I had a once in a lifetime opportunity to direct a full-length high school play. The kind of play where the whole school can be involved and people will actually pay to attend and watch. This was a lot of responsibility to give to a 16-year-old, but I relished in it. However, it was during this experience that I learned that collaborative art is all about compromises. You are working with limitations such as the pool of actors you can cast, the budget you have to get props and set dec, and the marketing capabilities to attract a crowd. Directing a school play taught me a lot about limitations. Your imagination is running wild, but all you get is the black box theatre and your peers. This is only a bad thing if you allow it to be. You can embrace the limitations and allow it to spark your creativity. Go at it alone means appreciating the pleasure of alone time and not allow other people to a) make you feel bad for spending time with yourself and b) hijacking your plans. So often in my life, I feel a spontaneous impulse to do something whether it’s to go out for dinner or watch a movie or go travelling. When I used to invite people to attend these events with me, there would be a lengthy back and forth of us trying to find a time that works for each other. My plan ended up not being my plan anymore. I end up needing to wait for someone else’s schedule to free up before I can do something I want. I don’t do that anymore. Sure, I still invite people, but if they can’t do it, too bad. They don’t get to reschedule your plan. I’m happy to go at it alone — in fact, it’s often more enjoyable. I learned to highly value alone time. Play your own game is my way of saying stay focused on your own goal. It’s so easy in life to get caught up chasing someone else’s pursuits. When playing hockey at 8 rinks you can hear the team on the other rinks celebrating. You’ll look over and be like, oh man, that’s great, I wish I was winning. But then, you have to focus on your own game. You need to play your own game. Nobody else’s. It doesn’t matter who is winning or losing elsewhere. They are playing another game. Other’s successes don’t mean your failure. This is a fact of hockey and a fact of life. In this social media infested world, it’s easy to be influenced by other people. But what other people are doing doesn’t affect you. What other people think or say doesn’t affect you. You have to play your own game and concentrate on reaching your goal because other people are doing the same. Ask yourself, are you playing your own game or are you playing someone else’s? Look up and look down means finding the balance between gratitude and persistence. I often bury my head in my work, trying to find progress and create more. I stress myself out and beat myself up to do more and feel accomplished. I rarely do, because once I reach a new level, I’m already thinking about the next. When I’m looking up towards the next stage, I have to remind myself to look down and see how far I have come, see how far I have climbed. I have come a long way. What once seems so hard and unachievable has now become my routine. I must remember that. The best way for me to remind myself is to speak with someone from high school or college. It reminds me that there are people who are aspiring to be in my position. Which is both flattering and gratifying. It makes me appreciate what I have. This is something that needs to happen daily: look up and look down. Be defiant. If something goes against your DNA or your philosophy, you need to be defiant and resist it. My parents wanted me to be a lawyer or a doctor. Classic. They wanted me to play pianos. They set the trap for me to be the son they imagined. I made myself my own person. I chose my own path. The person I am today is with my choice, I can never be resentful to my parents. They let me choose. Being defiant is all about knowing what you want to be. It’s about being defiant and decisive. You cannot have one without the other. If you don’t have a direction for yourself, other people will create them for you. People will be happy to create plans for you because they have no stake in it… it’s not their lives, they don’t have to work for it, it won’t make them any happier or sadder, but it will affect you. It’s so important that you take control of your own life. 25. How I learned to learn: Don’t be taught, do! I love learning, but I hate being taught. I’ve been to school. I’ve sat in classes. But I can’t be taught. I have to learn. It has to be my decision to learn. I have sat in class with the teacher talking about stuff. I need to actually do something to learn. I can be coached. But I can’t be taught. When I was young, my mother wanted me to play piano, we went to every class on my Saturdays and it was torturous. I never did learn how to play piano, because I never had any interest in it. You cannot be taught, you must practice and do. Teachers can only inspire you to improve, but you need to do. If there is something you want to learn, start by doing. The first part of any activity, task, skill, etc. can be attempted by yourself. There are enough sources out in the world for you to start doing. Read a book, watch a video, and get the supplies to start — you can do it. Don’t wait for a teacher to arrive. A mentor will show up when you are ready. You cannot force it. You cannot force people to like you, to hire you, to date you, to sleep with you, to be your friend — you cannot force people to do anything. I remember being in a relationship once and we had an argument, so she turned off the phone. I kept calling and calling. The phone was off the whole time. Don’t force it. I remember once, someone asked me if I wanted to write for their blog. Loose prospects like this is quite common. Few of them materialize. I thought I was being persistent. I emailed them over and over again saying yes. I called them a few times as well to only get the answering machine. They never responded. You can’t force it, you simply need to keep doing you and put yourself out there. When people want you, it’s seamless. The force is not with you. but I don’t cringe when I listen to the top 40. I appreciate how hard it is to get to the level where you can have a massive audience. It’s not easy to be riding the highest wave. It takes a lot of work to get there and I respect that. Pressure is a privilege is a title to a song by the musical artist JJ. It’s also a quote from a tennis player, Billie Jean King. For me, it’s such a fantastic philosophy. It moves the needle from stress to grateful whenever a situation arises where I feel pressure to perform. At any moment you feel anxious, nervous that you are going to let someone down, remember that that is the greatest honor. To have the weight of the world on your shoulder, means you are strong enough to carry it. I love it. I know I’m out of my comfort zone and doing something that someone cares about when I feel that pressure. This is common when writing for a publication or at work or playing in a playoff game. I’m representing not only me but my friends, my family, my team. When I feel the most pressure, that’s when I know I’m doing something that matters. Nobody is a nobody is a fairly simple lesson, but it’s probably the one I fail to practice most often. An impactful moment for me in acting school was when another classmate and I were looking at headshot photos that were hung in the lobby of the school. My classmate pointed at one and said, “Who is that?” I didn’t recognize the person, so I naively said, that’s nobody. My instructor came up behind us and, in a stern voice, said, “Nobody is a nobody.” I felt so small after that. I realize what she meant now. We are all working so hard, we are all pursuing our passion, we are all giving ourselves a chance when we take a headshot and say we want to be an actor or whatever. We are all someone trying to make waves a vast ocean. We are all somebody. I love this lesson because if we start treating people like somebody, we become somebody ourselves. Thank you so much for reading. I hope these lessons have helped you. It was nice for me to get them down. Maybe in 30 years, I’ll look back, read them, and shake my head — but today, it’s been a good reflective exercise. Buy me a beer, it helps to keep me inspired. Formerly published in Techvibes Media. Notebook computers have become more efficient and affordable in the past few years so it is no surprise that it is replacing those primitive coil paper notebooks. But the great debate continues, is the technology a beneficial asset or a hindering distraction? In a recent study published in the Computer & Education journal, research subjects attended university-level lectures and completed a multiple-choice quiz in two experiments. The first experiment was constructed to evaluate how multitasking affects the participant’s learning ability. The subjects were allowed to use their laptops to take notes during a meteorology lecture. But half were expected to complete a series of unrelated task on their computers during moments where they had spare time. The tasks were made to simulate normal activities that may distract students, such as online searches. The second experiment required the subjects to take notes on pencils and paper, while others were on laptops. The objective of this part of the study was to see whether students working the old-fashion way would be distracted by the bright screens and tapping keys around them. “We really tried to make it pretty close to what actually happens in the lectures, we found that lo and behold, the students who multitasked performed much worse on the final test and those who were seated around peers who were multitasking also performed much worse on the final test,” said Faria Sana, co-author of the study. Like a contagion, laptops usage affects more than just the user, but also their neighbouring classmates. The result surprised many of the participants, who didn’t expect their marks to drop from using their computer. “A lot of students spend quite a big chunk of time in class doing things that are not related to the academic environment or aren’t directly related to the course or the lecture,” Sana said. 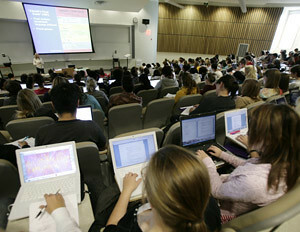 “We’re hoping that based on these results, students will take responsibility for their actions.” Although the study is not advocating a laptop ban in class, it is advising students to think twice before using their computers during lectures for extracurricular activities—for the sake of their own education and the people around them.